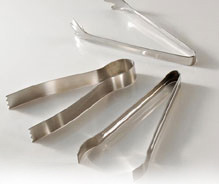 Reflecting the perfect combination of durability, style and comfort, our unique range of stainless steel tongs are extensively used for gripping food, ice, fruit & vegetable salad, meats, poultry and other edibles. Our expertise lies in manufacturing them in host of standard as well as customized designs depending upon the requirements of the clients. We offer these tongs at most reasonable rates. This piece of tong is ideal for turning, lifting and serving food. 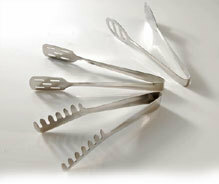 The handles of the tongs are ergonomically designed with a shallow channel for a comfortable and secure grip. These durable stainless steel tongs are true multitaskers—toss salads, flip steaks, add chill to the beverage or plunge into steaming pots. Comfortable grips and lock for safe handling. The highly polished togs features concave and prolonged tips for firmly holding the food material or ice. 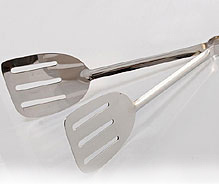 Made from quality stainless steel, these tongs are highly durable and dishwasher safe. 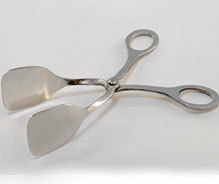 A combination of fork and turner, scissor tongs are perfect choice for pastries, salads and buffets. The design of the handles provide firm grip and safe handling. 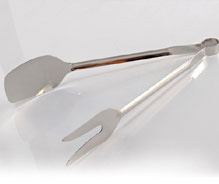 Professional-weight locking tongs with a scalloped edge for gripping food firmly. Made from quality stainless steel for superior performance and durability. 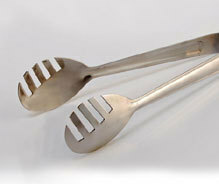 These tongs are specially designed for use in the kitchen or for serving table. Crafted from the highest grade of stainless steel, the locking tongs provide safe and comfortable handling. The innovative design of this tongs ensures comfortable grip and interlocking feature guarantees complete safety. 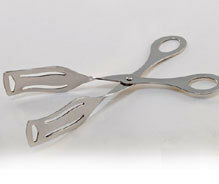 These scissor shaped tongs are highly durable, strong and have a beautiful brushed stainless steel finish. Simple yet highly functional, these tongs are perfect for turning, lifting and serving meats, poultry, shellfish and vegetables in the pan or on the grill. 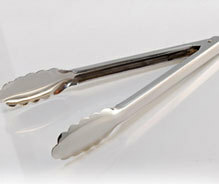 The design of the tongs ensure safe distance of hands from the hot surface, while the scalloped ends firmly grip the food.